Starbucks created their House Blend coffee in 1971 and it has been a favorite with customers ever since. It is still one of their best selling blends, even though we typically see Pike Place brewing when we visit cafes these days. 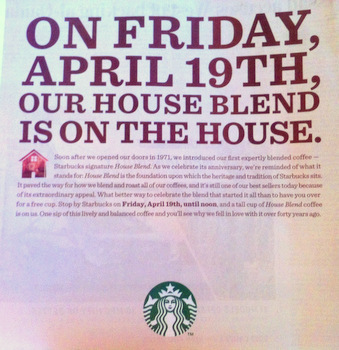 On Friday, April 19th, you’ll definitely see House blend brewing at Starbucks again because the company is celebrating 40+ years of House by offering free tall cups of House blend to all customers who stop by Starbucks before noon. It’s definitely worth dropping in for a cup on your way to work.